In a bid to contain rebellion in the state Congress and prevent “sabotage” of byelection campaign in Amritsar, the All-India Congress Committee has directed Bir Devinder Singh, chief spokesman for the party, to send daily feedback from Amritsar to its president Sonia Gandhi and other senior leaders. This was disclosed by Bir Devinder Singh while talking to The Tribune after the inaugural election rally of the Congress in the Amritsar (South) constituency here today. The Congress received a shot in the arm with many loyalists of Capt Amarinder Singh, former Chief Minister, attending the rally. However, Harjinder Singh Thekedar, Jugal Kishor Sharma, Jasbir Singh Dimpa, all former MLAs, and MLA O.P. Soni (Capt Amarinder Singh’s loyalists) were conspicuous by their absence. Addressing the rally, chief of the PPCC Rajinder Kaur Bhattal and Bir Devinder Singh asked Thekedar to join the party mainstream, otherwise it would not wait for him any longer. Three out of four Congress MLAs, including Makhan Singh, Ajaib Singh Bhatti and Gurpreet Singh Dina Kangar, who were served notice by the disciplinary action committee, were present at the rally. However, fourth one and Capt Amarinder Singh’s loyalist Jeet Mohinder Singh Sidhu, an MLA from Talwandi Sabo, stayed away from the rally. Bir Devinder Singh said Capt Amarinder Singh would also address party rallies in the coming days. “We will make special arrangements, as per his convenience, to ensure his participation in rallies,” said Bir Devinder Singh. Meanwhile, Thekedar said being a loyal Congress worker he would work for the victory of party candidate Navdeep Singh Goldy. Apart from Capt Amarinder Singh’s loyalists, including Vijay Singla, Sukh Sarkaria, Dr Raj Kumar, Harpartap Singh Ajnala and Sawinder Singh Kathunangal, a large number of senior party leaders, including Iqbal Singh, secretary of the AICC, Mohinder Singh Kaypee, working president of the AICC, Lal Singh, Avtar Singh Brar, Tript Rajinder Singh Bajwa, Tej Partap Singh, Kanwnaljit Singh Sunny, Gurkanwal Kaur, Sukhpal Singh Khehra and Rana Gurjit Singh were present at the rally. However, many former councillors from Amritsar (South) did not attend the rally. It was learnt that most of the loyalists of Thekedar skipped the rally. Addressing the rally, the PPCC chief lambasted SAD president Sukhbir Singh Badal and Chief Minister Parkash Singh for promoting members of their family by ignoring those who had worked selflessly. Activists of the SAD (1920), led by Rachhpal Singh Mahal, joined the Congress. To check corruption, accounts of political parties should not be beyond public scrutiny or even public view, rules the Central Information Commission (CIC). It also wants eight of country’s chief commissioners of Income Tax (IT) and also commissioner, IT of the Central Board of Direct Taxes, to make public by mid-June IT returns and assessment orders of five years of 20 major political parties, including the Congress, the BJP, the Shiromani Akali Dal and the Indian National Lok Dal. Though various laws and directions of the Election Commission want political parties to maintain accounts and regulate their election spending, political parties continue to enjoy immunity on making public their income tax returns or the tax they pay to the government. “It would be facetious to argue transparency is good for all state organs, but not so good for the political parties, which control the most important of those organs. For example, it will be fallacy to hold transparency is good for the bureaucracy, but not good enough for the political parties which control the bureaucracy through political executives,” said the order of the CIC. The CIC ruling has come on an appeal by a Delhi-based NGO, the Association of Democratic Reforms, which sought details of IT returns and assessment orders passed by competent IT authorities for five years in case of the BSP, the BJP, the CPI, the CPM, the Congress, NCP, PDP (J&K), RJD, JD (Biju), JD (U), INLD, NC, JD (S), SP, DMK, AIDMK, SAD, Telugu Desam Party, Shiv Sena and AGP. Eight IT commissionerates had refused to release IT returns and assessment orders to the NGO saying they were not allowed under the Income Tax Act to disclose third party’s details. The NGO preferred second appeal against these orders after the first appeal was turned down. The CIC in its latest order held today, transparency and accountability are spoken of together- as twins. The higher the levels of transparency, the greater the accountability. This link between transparency and accountability is sharply highlighted in the preamble of the RTI Act. The CIC, however, rejected the demand of disclosing PAN of the political parties. The samadh of Sher Singh (1807-1843), son of Maharaja Ranjit Singh and ruler of Sikh state of joint Punjab, in Lahore has been vandalised beyond recognition. No trace is left of the samadh of his son Kanwar Pratap Singh. 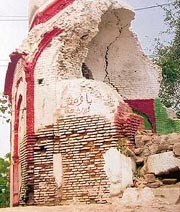 Its remains have been painted red and green to merge with the mosque nearby. Bobby Singh, director of the UK-based S.K. Foundation (dedicated to preserving the Sikh heritage), stated this after a tour of Pakistan to The Tribune here today. He also discovered that the samadh of Bhai Vasti Ram, spiritual guide of the Maharaja in Lahore, also lay derelict and vandalised. Sikh heritage would vanish forever. In a search for Sikh monuments, the Foundation director also visited the hostile terrain of Peshawar by imperilling his life. He said he travelled further north into a tribal territory near the Afghan border at a great risk and ventured into the Jamrud Fort, built by the founder of the Sikh commander in 1823. Describing his visit to Pakistan’s hostile terrain, Bobby Singh said he visited the area with his security guards where ordinary shopkeepers had displayed rifles, Ak-47 rifles and rocket launchers like vegetables. They are proud selling such firearms and it is just normal in this arid landscape. The highlight of his itinerary was the Jamrud Fort, the foundation stone of which was laid by Gen Hari Singh Nalwa and was completed in six months by Kanwar Nau Nihal Singh, grandson of Maharaja Ranjit Singh. He said the amazing mud fort which at present was under the border paramilitary forces, still stands defiantly and some parts of the walls are 2-m thick. The actual cremation site of General Nalwa is clearly visible, but out of bounds for the public. He, however, was able to take some snaps despite the presence of watchful Army sentries who were clearly glancing down at him. “I thought for a moment that perhaps I was the only Sikh that had come to Jamrud since Partition and fulfilled dream of viewing the famous Jamrud Fort”. Further northeast in Hazara, Bobby Singh located the Harkrishan Fort also built by General Nalwa during his stint as Governor of the province. However, nowadays only some parts of the fort exist that house a police station. Originally, the fort was surrounded by water and a drawbridge must have been used to gain access into the fort. There are numerous Sikh monuments that lie in ruins in Peshawar. Bobby Singh said the S.K. Foundation (UK) was set up for trying to highlight and educate others to the cause before it was too late. If the assurance given to Gurdaspur MP Vinod Khanna by union civil aviation minister Praful Patel is anything to go by, the backward border district of Gurdaspur may soon have a flight by the national carrier Air India. Khanna has also sought international airport status for the Pathankot airport on grounds that it is both a gateway to Jammu and Kashmir and Himachal Pradesh, and its runway is long enough to accommodate a Boeing and Airbus. The demands come in the wake of serious business losses to Gurdaspur, which had earlier benefited due to the approval of the Pathankot airport by the Airports Authority of India and the consequent commencement of the Air Deccan Pathankot-Delhi flight. The flight was later discontinued, causing loss of business to the backward border district where a lot of businessmen had started showing interest in setting up their units. Khanna is now also in the process of creating an infrastructure for a multi-facility sports stadium in Gurdaspur and there is a plan to develop Ranjit Sagar Dam as a major tourist destination for water and adventure sports both by the state and Central governments. The dam has a 20-km-long lake. “But these plans can’t fructify in the absence of connectivity by air. We have apprised the union civil aviation minister of these issues. Besides, a flight is also essential to restore the faith of those businessmen who have been having second doubts about investing in the district after the cancellation of flight. Under the circumstances, we have sought the minister to grant us a flight by the national carrier Air India,” Khanna today told The Tribune. In his letter to Patel, he has also asked for a reasonable fixed fare, stating that the fares sometimes go up to Rs 9,000 one way and become unaffordable down the line. In a petition sent to the Punjab Election Commission today, the Punjab Congress has alleged irregularities by the ruling SAD-BJP alliance. The Congress has raised the “arbitrary and unfair” rejection of nomination papers of Congress nominees in Mohali, Ropar, Fatehgarh Sahib and Anandpur Sahib and surrounding areas. Congress leader Jagmohan Singh Kang said the ruling alliance had virtually terrorised the administrative machinery into rejecting the nominations of Congress nominees on flimsy grounds. “There is just no justification for rejection of these nominations, but these people owing allegiance to the Congress”. The Congress leadership would oppose this and cautioned the administration in Punjab against this. Citing examples of Charanjit Singh, Jarnail Singh, Jagdeep Singh, Ravinder Singh, Reena Rani and Balwinder Kaur, Kang said, “The rejection of nominations of these candidates was wrong, illegal, arbitrary and gravely unjust”. Most of these rejections brought to the notice of the Election Commission by the nominees themselves through a letter pertain to Khizrabad, Majri and Tira zones in Kharar tehsil. In the letter, the candidates whose nominations have been rejected have alleged after the nominations were filed, the returning officer, finding nothing deficient, accepted these. “However, in the receipt issued to us, the number of pages that we submitted as supporting documents was not mentioned”. This letter was used for rejecting nominations. The above-said six candidates in their petition to the commission said, “The procedure for scrutiny adopted by the returning officer was neither legal nor fair or transparent. No opportunity was accorded to us to raise any objection to nominations of other candidates”. The returning officer further violated Section 40 of the Election Commission Act, it is alleged. They further alleged that after talking to the SAD-BJP and BSP nominees separately, the returning officer met the Congress candidates and said the papers of Khirzabad, Majri and Tira zones had been rejected and the nomination papers of the covering candidates accepted, but as independent candidates as “the letters allotting the Congress party symbol to the said covering candidates are missing from their files”. Alleging that the returning officer had done this to please the “SAD-BJP masters” and for other extraneous consideration the candidates had sought the commission’s intervention. Though the Sangrur district unit of the BJP is contesting two Zila Parishad (ZP) seats (Andana zone and Mangwal zone) on its own, a poster was today found pasted on walls in the Andana zone, claiming that Makhan Singh Chandu, SAD candidate, is a candidate of the SAD-BJP alliance for the zone. Talking to The Tribune, district president of the BJP Jatinder Kalra said there was a lot of resentment among BJP leaders and workers over the display of the poster. There was no alliance between the BJP and the SAD in the ZP and Block Samiti elections in Sangrur district, he added. He said apart from two ZP seats, the BJP was contesting 12 Block Samiti seats in the district. He would complain to the district election officer and the chief election commissioner in this regard. Meanwhile, general secretary of the SAD and area in charge of the Lehra Assembly constituency Prem Singh Chandumajra claimed earlier Joginder had been demanding ZP ticket from the SAD for the Andana zone. When he could not get it, he shifted to the BJP. Shiromani Akali Dal candidate Inderbir Singh Bularia today got a shot in the arm when two former councillors of the Congress joined the SAD here today. Partap Singh Pakhiawala and Baldev Singh were welcomed into the party fold by Chief Minister Parkash Singh Badal at separate rallies. The two councillors said they, along with their supporters, would work for the victory of Bularia. Meanwhile, the Chief Minister addressed a number of rallies in the constituency and inaugurated an election office in Ward No. 29. Punjab information and public relations minister Bikram Singh Majithia today thanked Chief Minister Parkash Singh Badal for getting the death sentence of Indian prisoner Sarabjit Singh stayed indefinitely. Thanking on behalf of people and residents of Amritsar in particular, Majithia said citizens of the country would remember the role played by Badal in getting Sarabjit back from the gallows. He said it was Badal who mooted the idea of unanimous resolution and requested Prime Minister Manmohan Singh as well as the union external affair ministry to plead the case of Sarabjit effectively. He said Badal met many MPs and ministers to exert moral pressure on the Pakistani government to reconsider the case of Sarabjit. Badal invited Ansar Burney, former union human rights minister of Pakistan, to Punjab so that he could meet the family of Sarabjit and know the reality at ground level. A renowned US-based company of consultants on Friday presented a detailed project report for the complete makeover of the holy city in the coming months. BJP MP Navjot Singh Sidhu, who had taken the initiative to invite top consultants for the complete revamp of the city, said Rs 100 cr provided by the state government for the city would be spent with total transparency and accountability. He said Amritsar would be the first city in the state which would be going for hi-tech development projects with new infrastructure. Earlier, managing director (MD) Satish Malik, Tetra Tech India Ltd, New Delhi, gave a detailed account of the Rs 106-crore project, estimates for reshaping the entire road network, landscaping, creating new traffic islands, entry and exit points, besides many other improvements in the traffic management. Malik, who gave the presentation in the presence of Sidhu and Mayor Shwet Malik, said the company had presented the complete design, drawings and other facets after conducting a complete survey through GPS satellite system. He said the city roads of 508 km would be completely covered under this project, using hi-tech technology for its longevity. The MD said hi-tech machinery, including sensor pavers and vibratory road rollers, would be used to give a smooth finish to the roads. He said they had earmarked Rs 87.4 crore for the improvement of roads and other infrastructure in the city. Sufficient funds had also been kept for this project for laying dry brick flooring and construction of drains, where new sewerage was proposed to be laid. The most significant part of the project included special clause for maintenance, for which more than Rs 6 crore had been earmarked. He said the entry and exit points of the city on both sides of the GT Road would be given a new look with landscaping and planting of ornamental trees. The project included a tourist refreshment point at the Gate of India towards Wagah/Attari border which could generate revenue for the municipal corporation. Four major roads would be completely revamped which include entry points to the Golden Temple, Durgiana Temple, Hall Gate and Lawrence Road. He said the project also included the construction of 10-foot overbridges on BoT basis at different locations. Provision of escalators had also been made for the old people on these bridges, he added. Punjab labour minister Tikshan Sud today said news reports stating that the minimum wages in the state had been revised to Rs 3,300 per month were incorrect, as the minimum wages board had not taken any decision in this regard. In a statement here, the minister said the government was yet to fix any revised minimum wages. He said this would be done in consultation with the minimum wages board, as the revision was due in 2006 and the previous Congress regime had failed to act on this issue. Currently, the minimum wages fixed for unskilled workers was Rs 2,000 per month or Rs 76.95 per day. Similarly, wages for agricultural workers was fixed at Rs 71 (with meals) per day and Rs 80 (without meals). Taking note of reports of alleged illegal detention and exploitation of a few Punjabis by officials of a transport company of Riyadh, Indian Embassy officials in the United Arab Emirates (UAE) have directed company officials to stop the victimisation. A majority of the Punjabis, detained illegally or in hiding to avoid inhuman action, were reported to have returned to their normal routine. According to Raghu Nandan Sharma, Congress leader, officials of Algairi Transport of East Riyadh had withdrawn illegal move against their employees. The attitude of the company officials changed after parents of the victims sought the intervention of the Prime Minister of India and secretary-general, United Nations, and a story was published in The Tribune on Tuesday. Referring to information received from their sons, parents led by Sadhu Singh of Sihar village, appreciated that the company officials had freed their employees from illegal detention by the police. They (company officials) had assured them that employees would not be maltreated. "As we had lost hope of getting our sons freed from the clutches of their employers, news of restoration of normalcy at their work place thrilled us. Though we do not know the sequence of events leading to the rescue of our kin, we were told that some officials, presumably from the Indian Embassy in the UAE had reprimanded the company officials for the alleged inhuman action," said Sadhu Singh. At least 30 Punjabis from Sihar, Bhutta, Zirakh, Akalgarh, Sangrur, Anandpur Sahib, Jargari, Kanganwal, Gobindgarh, Dhamot Bhadal Sua, Samrala, Bahdson, Laddwal, Hans, Rajjewal, Mallpur Dhadogal and Batala were either detained or had gone in hiding to avoid inhuman action by company officials. The parents of these youths had urged the Union government and the United Nations to rescue their kin. Nazar Singh, one of the victims, had said they were asked to confess they had stolen goods and fuel from vehicles they used to drive. Besides giving a beating, they were made to slouch on hot sand dunes and go without water and food. The Punjab Virasat Chairtable Trust has donated Dewan Todar Mal’s Jahaz Haveli to the SGPC. The Dewan performed funeral rites of two younger Sahibzadas of 10th Sikh Master Guru Gobind Singh - Baba Zorawar Singh (9) and Baba Fateh Singh (7) - who were entombed alive by Mughal rulers of the time for not embracing Islam. Prof Kirpal Singh, former professor and Head of Punjab Historical Studies Department, Punjabi University, Patiala, who has been assigned by the SGPC to edit an important religious work on Sikhism, says in history there were references to two Todar Mals. The first one became popular during the rule of Akbar. He was given the title of Raja and it is believed Rajpura town was named after him. He was also known as Todar Mal Khatri Lahori. He died in 1589 in Lahore. He used to read religious books at secluded religious places, but Akbar told him by spending time in the service of people he would become spiritually stronger and closer to God. Prof Kirpal Singh, who has given an authentic account of events of pre and post- Partition and also known for other works of history, says the other Todar Mal became popular during rule of Shahjehan and Aurangzeb. He was known as Todar Mal Shahjahani. He was given the title of Rai in 1640 and became Faujdar of Sirhind in 1641. During the same time, he was also given charge of the Lakhi jungle area. As per account in the Phulkian state gazetteer, he belonged to Kakra village, a few miles from Patiala. In 1648, he was given the title of Raja. After losing battle when Dara Shikoh came towards Sirhind, Todar Mal was in the Lakhi jungle area. It is said Dara took away valuables, including substantial cash of Todar Mal from Sirhind. Prof Kirpal Singh says references to both Todar Mals are there in ‘The Maathir-ul-Umara’ (volume II). The book by Nawan Samsam-ud-Waula and others has biographies of Mohammadan and Hindu officers of the Mughal period. A reference to the death of Dewan Todar Mal (second) in that book has surprised Prof Kirpal Singh. On page 958 of the book, translated into English by H. Beveridge long back, it has been written that Dewan Todar Mal died sometime in 1665-66. Prof Kirpal Singh says he has serious doubts on the authenticity of the year of the death of Todar Mal mentioned in the book because the younger Sahibzadas attained martyrdom in 1705. If book is to be believed, then Todar Mal died about 40 years before the martyrdom of the Sahibzadas. Prof Kirpal Singh favours more research on the accounts, though there are not many available on Todar Mal (second) and his family. He says he is almost convinced that the family of Todar Mal was very much involved in performing funeral rites of the Sahibzadas and it bought land by giving gold as price to cremate them. A tunnel has been found in the Jahaz Haveli of Diwan Todar Mal here. The tunnel runs from ruins of the haveli to a well in fields nearby. SGPC president Avtar Singh said the tunnel was found recently and after taking the haveli from the Punjab Virasat Charitable Trust, barbed wire had been put around it. Pictures from a book were being matched with the haveli after which restoration would start, he added. SGPC members, scholars and persons associated with the restoration work would meet on May 23, said Avtar Singh. A four-member committee formed to look after the restoration has been expanded to eight members. The members include former SGPC president Kirpal Singh Badungar, Divya Gupta, director, INTEC, Delhi, Dr S.P. Singh, director, National Museum, Delhi, Raghujit Singh Virk, senior vice-president SGPC, Dr Balwinder Singh, School of Planning Board, Guru Nanak Dev University, Amritsar, Navjotpal Singh Randhawa, Didar Singh Bhatti, MLA, Sirhind, and Anurag Singh. The committee would be coordinated by Dilmeg Singh, secretary, SGPC. Randhawa recently donated the haveli to the SGPC with the help of SAD leaders, including MP and SAD president Sukhbir Badal. The haveli was purchased by the Punjab Virasat Charitable Trust in 2003. Randhawa said the haveli was donated to the SGPC when some SGPC members approached him and assured to get it restored. A recent study of Dr Hitinder Gurm, a graduate of the Christian Medical College here, has found less invasive procedure of carotid stenting is as safe in preventing stroke as open surgeries in patients with severe blockage of carotid arteries. Dr Gurm is director of Carotid Interventions in Cardio-vascular Medicine at the University of Michigan, USA. The study called Sapphire and based on 260 patients randomly assigned to one of the two treatments at 29 hospitals, was published in the April 10 issue of the New England Journal of Medicine by researchers from the University of Michigan Cardiovascular Center, Harvard University and others. The study is chaired by Dr Jay Yadav, another NRI physician. “Patients undergoing a procedure want to know if they’ll be protected long-term from stroke. Research shows the procedure is safe,” said Dr Gurm, the study’s first author. Two carotid arteries supply most of the blood to the brain. These arteries can develop blockages like arteries in the heart and can cause paralysis or stroke. The findings of the study show carotid stenting is as safe as surgeries. On telephone from the USA , Dr Gurm said, “Research showing effectiveness of less-invasive surgery in stroke patients will send positive results among patients as well as medical practitioners. Patients in India are likely to benefit more from the stent surgery”. In the light of ploughing of nurseries of paddy seedlings by government officials throughout the state these days, the BKU (Ugrahan) has asked the state government to give at least six-hour daily power supply to tubewells to help farmers sow cotton, narma, green fodder etc in their fields. It is worth mentioning that the state government has asked the farmers not to start work for the preparation of nurseries of paddy seedlings before May 10 and the work on the transplantation of paddy crop before June 15. District vice-president of the BKU (U) Darbara Singh Chhajla said for the diversification of crops and to keep the farmers busy, at least six-hour daily power supply was necessary, otherwise farmers would have to sit idle. He said these days electricity was being supplied to the tubewells for one to two hours daily, which was insufficient. Expressing concern over the non-lifting of wheat crop from grain markets, Chhajla asked the government to procure the produce at the earliest as the arthiyas were not making payments to the farmers on the plea that the crop had not been lifted by the agencies. Chief Minister Parkash Singh Badal today greeted the people of the state on the eve of the 285th birth anniversary of Jassa Singh Ramgarhia, the great Sikh warrior of the 18th century. Badal urged the youth to perpetuate the glorious legacy of Ramgarhia, who fought the Mughals to safeguard the moral and ethical values of the humanity based on the tenets of the Sikh Panth. Badal said the real tribute to the brave soldier, who avenged the barbaric acts of Mughals to restore the glory of the Sikh Panth, would be to follow the path of righteousness and self-sacrifices preached by him for the uplift and betterment of the society. Ridiculing US President George Bush’s understanding of food crisis and holding India responsible for it, Punjab finance minister Manpreet Singh Badal today said Bush should thank India for bringing down wheat price in America. Manpreet said bumper wheat crop in India had led to a fall in wheat price in the international market. The USA was the most benefited country by bumper wheat crop in India. He said in Chicago and other parts of America, wheat price, in Indian currency, had gone up to Rs 2,100 per 100 kg in February-March, but it had come down now to Rs 1,400 per quintal. He said Punjab alone had contributed about 10 million tonnes of wheat to the national market helping ease situation on wheat front in the international market. Manpreet said it appeared that the American President was not aware of India’s role in fall in the wheat price in the international market and its consequent benefit to American people. Bush should not worry about the increasing demand for food items in India, but compliment its farmers for contribution on the food front. The minister said had India entered the international market to import wheat this year, its price would have gone up even beyond Rs 2,100 per quintal by now. Manpreet said owing to record wheat production in the country this year since 2002, the situation on the wheat front had started normalising at international level. Instead of blaming India, Bush should realise how American companies had contributed to global warming resulting in food crisis all over the world. Because of global warming, food production had been hit in some parts of the world and America, that had been avoiding to sign pacts on global warming, was a main culprit for causing environmental disaster world over. Punjab cooperation minister Capt Kanwaljit Singh has assured property dealers of the state to solve their all problems in the state. At a meeting of office-bearers and members of the Patiala Property Dealers Association, the minister assured them that he would take up problems and issues of property dealers of the state with Chief Minister Parkash Singh Badal after Block Samiti and Zila Parishad elections. “I will personally talk to the Chief Minister in this regard,” said Capt Kanwaljit Singh. He said the government would take every step to solve the issues of property dealers, including reducing registration rate of land. He said the government was committed to safeguard interests of every section of society. Earlier, welcoming the minister, Pargat Singh, outgoing president of the association, which elected Joga Singh Chapar new president, said people had turned their backs towards the purchase of property because of the high registration rates of land. The rates according to property dealers were increased without any reason. Hardip Singh Khera seconded Chapar’s name and the dealers gave approval by raising hands. The minister honoured the newly elected president with a robe of honour on the occasion. The President of India will confer the prestigious B.C. Roy Award on Dr Gurpreet Singh Wander, head of DMC Heart Institute. He will be awarded for the development of speciality in the state. This is the highest award in the medical field. A committee of doctors of international repute, along with one nominee selected by the Prime Minister, selects the recipients. Wander, who joined the DMC, Ludhiana, in 1988, was instrumental in establishing the Cardiology Department here. Senior doctors of the Indian Medical Association (IMA) congratulated Dr Wander for the award.